The categories we will primarily focus on are fitness and motivation. Our product will serve people already at the gym and/or exercising on their own, regardless of whether they are gym junkies or just getting back on the exercise bandwagon. The solution will need to be a modular, flexible system which meets individual's unique exercise needs and can move around with them throughout their day. It needs to be washable/cleanable and waterproof. “Augmented memory” be applied to this population through the tracking and compilation of the audiences’ health and fitness statistics and their friends’ statistics. After feedback from class instructors, we found academic research on internal and external motivation, training effectiveness, and personal training techniques. The information we found in these studies directly impacted the questions in our diary study and our analysis of findings. In our diary study, we focused on finding information that was not addressed in our academic findings. We also grouped our users into “Novice” or “Expert” categories, as defined in current research. We plan to deploy a combination of Elicitation and Feedback study methods for this assignment. Our primary goals for the diary study are to learn how our participants prepared themselves to exercise, understand demotivating factors, location routines, and pinpoint differences between novice and expert level workout regimens. We hope that collecting this information will enable our team to further scope our project’s design and requirements. The goal of this section is to help our team learn more about the participants current level of fitness expertise, typical workout regimen and basic demographic information. Our study will consist of 9 participants over the course of five days, with varying levels of fitness expertise. Once the pre-diary questionnaire has been collected, we will ask the participants to begin the full diary study. Our participants will answer a series of probing questions each time they complete a workout. On workout days, we will break up the questions into 3 parts: pre-workout, workout, and post-workout. The questions will collect data that summarize their day, how external factors affected their workout, clothing, physical items brought, significant locations to and from the place of workout, workout type, motivation levels, goals for workout, mood during workout, external stimuli (TV, music, coach/trainer, friend) and roadblocks that frustrated, confused or distracted them from their routine. On days where our participants do not work out, we will ask our users rest day questions. From these questions, we will learn if it was a scheduled rest day or if it was unplanned. If it was unplanned, we can learn about external factors that affect and unmotivate our users. We plan to ask our participants to answer these questions verbally by recording their answers through their mobile phone’s voice memos application. Our group feels that by answering the questions out loud our participants will be forced to think through their answers more thoroughly than simply asking them to fill out a paper questionnaire after their workouts. The team also thinks this will be a less invasive way for participants to record their information as they are more likely to have a phone with them than paper. Participants will be instructed to email each recording to a team email address once the 5 day study period is over. We chose to ask these questions post-workout, rather than pre-or-during, because we didn’t want this study to alter participants’ motivations or distract them from their normal exercise routine. We also feel that it is important to know if they have any post-workout routines, which would be harder to record pre-workout. Participants go to the gym or to work out from home even if they're working or elsewhere. Most of our participants did not carry exercise clothes or accessories with them and decided to go home before exercising. Even though our sample size was small we feel that this was an important finding as it contradicted our original hypothesis that many participants prefer to go to workout straight from work. Participants tend to bring their phone and headphones to exercise. We found that the majority of our participants preferred some form of music while exercising. Comments from participants included positive feelings when the music matched their workout and negative feelings when it didn't. The hardest part of exercise is starting. Our participants agreed that the beginning of the exercise was the hardest. They often felt that they needed that initial push to get them going. This was also the reason none of the participants found themselves “in the zone” at the beginning of their workout. Homework, social events, work, and other responsibilities get in the way of going to exercise. We saw that most of our participants took a rest day only when something came up in their personal lives. Quite a few of the observed rest days were unplanned and their reasons were due to other commitments coming up. It was also observed that participants were more likely to rate their workouts lower if they were rushing to fit the workout into their schedule or had a very busy day. The participants mentioned that they tried to do what they could each day, as they believed some form of workout was better than not working out at all. Participants that worked out with others felt they were more motivated and found themselves more in the zone than those that did not. Participants were concerned with their form. Both novice and expert users were concerned with their form during exercising. Novice users were unsure of their form. Novice users, unlike the expert ones, were concerned with their form but unsure how to maintain good form and what good form was in general. For the ideation process, we focused on our main findings and how these findings could be incorporated or help shape our previous concepts: The Always Available Personal Trainer, The Biological Data Sensor that can go anywhere, and The Social Motivator In the Periphery. 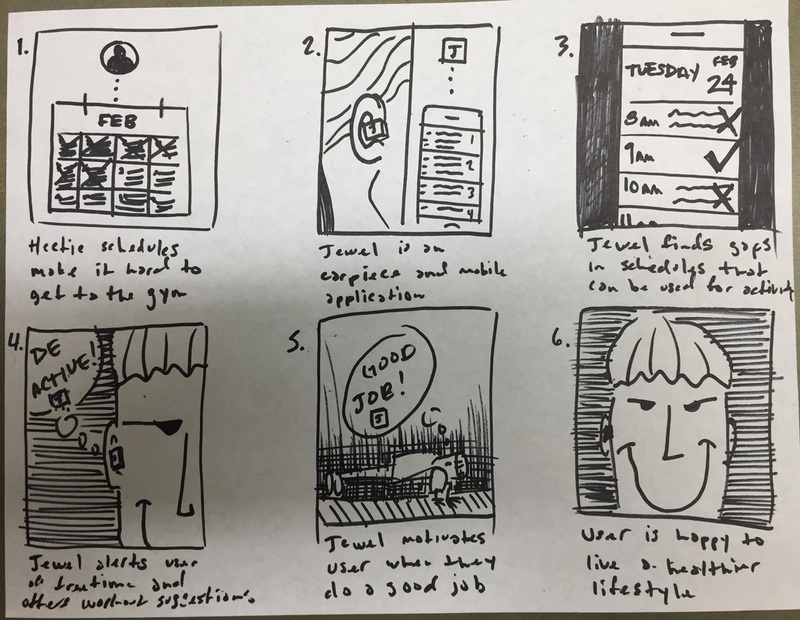 We grouped our ideas, concepts, and sketches three main categories to better understand the relationships between them: Distraction and Demotivating Factors, Social Exercise, and the Importance of Form. Among the many criteria for ideating, the highest weighted was that our solution had to be portable. Our concepts had to be able to flexible enough to be used in a gym setting, home, and outdoor setting. The final concept will also have to be usable for different types of exercise. Since our users, primarily go home and then workout, we have the opportunity to place a more permanent display within the home. By putting these requirements in place, we have to think of creative ways for our users to wear the device. For example, many of the ideas related to a headpiece or headband were discussed were discarded because of problems and difficulties related to sweat and potential motion sickness. Ideas for VR and large displays were also discarded, as they were not portable or practical to bring into a gym setting. Our participants were often distracted by social events, homework, responsibilities. This was the most common reason for an unplanned rest day. They had difficulty starting to exercise. In some cases, participants felt that getting some exercise, even if it was within the home, was better than no exercise. These findings tied in with our personal trainer concept. We wanted to create a device that would help motivate our user when you were feeling demotivated. We started off with an idea of an external object that would know when you were home and would encourage you to exercise. However, it was important that this object was portable. The final version of Jewel is some kind of ear cuff, or ear piece. Based on the idea of Jane from the novel Speaker for the Dead, and J.A.R.V.I.S in the Iron Man movies, this small device would become a motivating friend who would remind you to exercise. Jewel could even banter with you, trying to motivate you to do one more pull up or 500 feet, even when you feel tired. Our participants, both novice and expert, found that they often focused on form. However, Novices expressed that they do not know which form is correct. These findings tie in with our concept that explores the need for a The Biological Data Sensor that can go anywhere. The Balance Shoe would have four pressure sensors within the sole, two on either side, and one at both the toe and the heel. The FitFix Shoes would tie in with a wrist or body monitor of some kind. This monitor would let the Shoes know what kind of activity being performed. 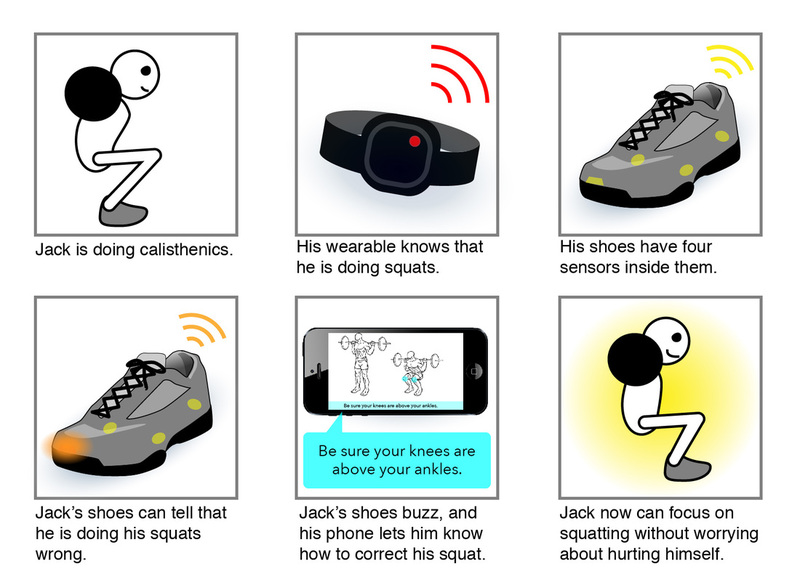 The shoes would then use the pressure sensors to tell if the activity is being performed correctly. For example, while, if the pressure is too much in the toe while doing squats, the shoe would know that the form is off. The shoe would vibrate slightly, and a corresponding phone application would pop up. The application would indicate how to correct the form (having ankles below knees). Users would feel better knowing how to do their exercises correctly, without hurting themselves or having an ineffective workout. In addition, the Balance Shoe could also tell runners if they are running pronated or supinated. Peripheral Motivation: The solution for Social Exercise. Our participants found they were motivated by a social presence while exercising. These findings tie in with our concept that explores a Motivator in the Periphery. Peripheral Motivation would be a touch screen that would stay at your home. It could also be synced as a computer, TV, or phone background. 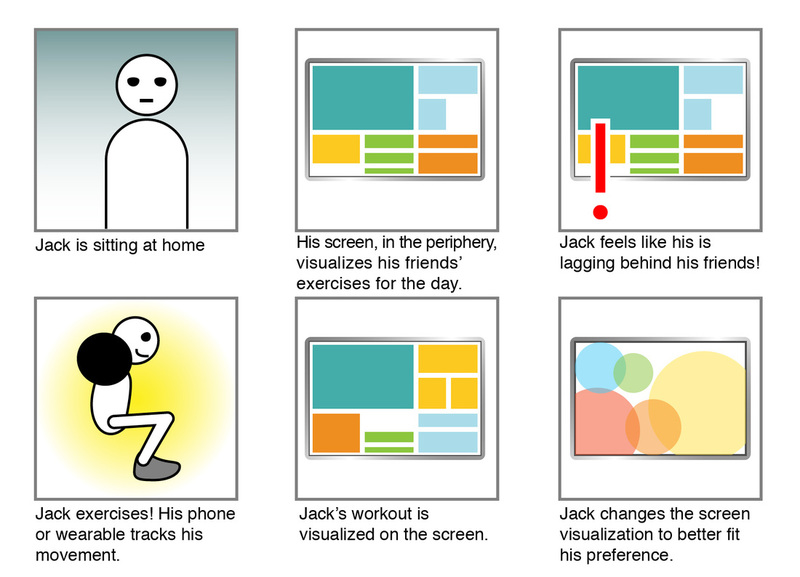 The Peripheral Motivation screen would visualize your personal and your friend’s exercise throughout the day. If your friends were exercising a lot, their shape would increase in size. You could press on a friend’s shape to see what kind of exercise they did, for how long, and where. Color saturation would be determined by the kind of exercise done. This piece would become like a piece of art throughout the day, as people did exercises. Users could pick what “style” of art they would like to create on their peripheral media. We have currently identified our target audience and have a fair understanding of the environment and activities that we would like to focus our design ideas on. Through the storyboards and design ideas we have formulated three ideas that we could potentially pursue with our final design. We feel that after conducting our diary study, coupled with our literature research and introductory user findings, we have enough to go on and are confident with the design decisions that we have made.